Ali Walsh looks at a few ideas to make this Easter fun-filled and yummy! There are so many things to love about Easter. It can be wonderful to get the family together for a break from the usual grind, plus there’s excitement for little people with egghunts and Easter bunnies. But being coeliac can throw a spanner in the works. Aside from the usual complications that invariably accompany any big event, making sure there’s gluten-free food available is just another bug-bear for many of us. Sure, there are silver linings. There’s four days off work, for a start, not to mention a lamb roast and chocolate galore. But wouldn’t it be wonderful not to have to think about gluten for once? To know that your needs (and those of your children) had been taken care of? Well, fear not. Below are some Easter ideas that’ll have you and your family rejoicing, whatever your budget and location. And it’s not just about family, either. 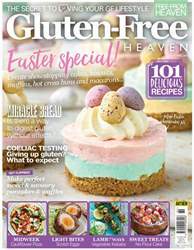 If you’re taking time for yourself this Easter there are plenty of things to be getting on with, and you may just end up embracing a new love of gluten-free.